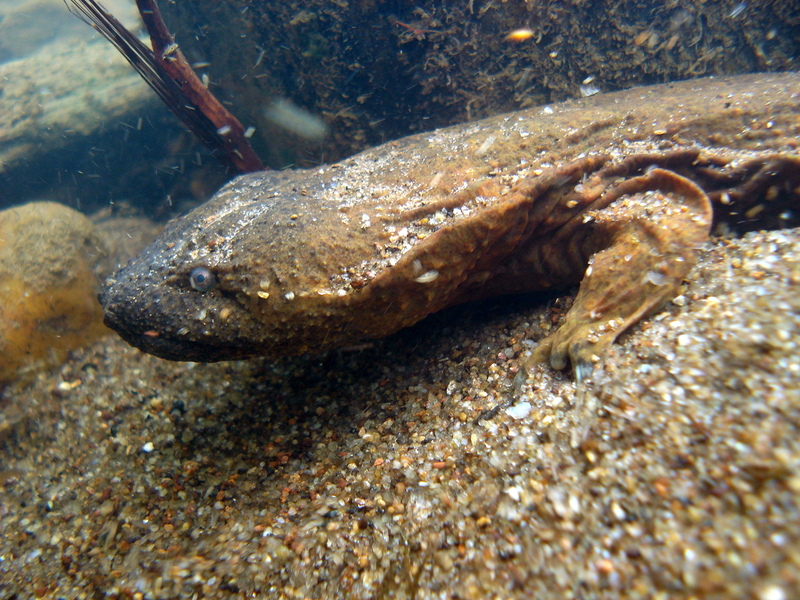 S ome areas in Western North Carolina provide a haven for imperiled Eastern Hellbenders with large populations scattered about the region; however, this giant salamander is declining across its range and North Carolina is no exception. For years now, Wild South has worked with partners in the region to help keep Hellbenders from making their way on to the endangered species list through outreach, education, and active conservation by building and deploying nest boxes. Now, we are asking you for help to make sure these lovable giants have the habitat they need to thrive in our waterways. The only way to ensure the survival of Hellbenders is to make sure that there is high quality habitat available across their range. This is a challenge in some areas and we have been working hard this year to identify some of the areas that need the most help. Below you’ll find an interactive map that shows the watersheds that we have identified as needing the most support from private land owners with waterways on their property. Use this map to check and see if your property falls within one of these watersheds by typing your address in the search bar. Also, explore these watersheds and if you know anyone in those areas reach out to them and see if they or anyone they know has a stream that could benefit from restoration. Now, if your property or a friend’s property falls within one of these watersheds how do you know if it could benefit from restoration? There are a few simple things that you can look for to help you figure out if restoration is the right call. If you notice either of the 2 items listed below, give us a call at 828-258-2667, ext. 4 or email morgan@173.236.11.114 and we’ll come out and take a look! 1) A waterway should have trees and shrubs along its banks. If there is no or very sparse vegetation along the bank, then those banks could erode away during high water events. Even if there haven’t been any bank failures yet, they could be just one high water event away. 2) If you can see exposed soil or vertical banks, then that is an indicator that stream restoration is needed. 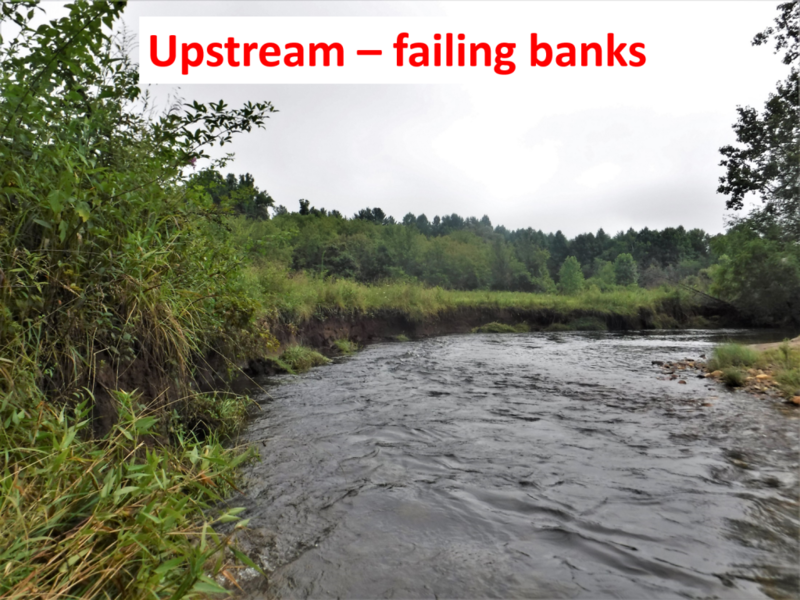 When banks reach the point where they are vertical, that means bank failures are eminent and sedmient is being washed away downstream and clogging up the nesting rocks that hellbenders depend on. Restoration activities aren’t always a big deal, either. Sometimes it is as simple as just planting a few bushes and trees along the creek that can make all the difference for aquatic wildlife. Trees and shrubs provide stability to the banks by holding all the soil together in their extensive root systems. 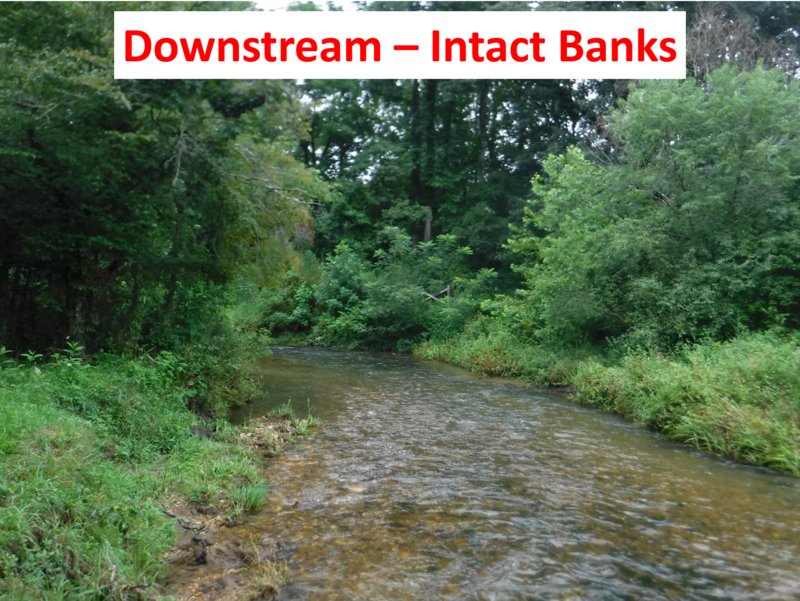 The differences between forested and bare stream banks can be stark, as seen in the pictures below. As you can see, when the banks are bare erosion can be severe, but on the same river just about 50 feet downstream where the banks have sufficient vegetation there is very little erosion and the stream looks healthy and natural. So, let’s protect these streams from erosion by planting vegetation on their banks to help protect hellbenders! If you or someone you know needs help with stream restoration in the watersheds in the map above, please contact us and we’ll help you improve water quality and enrich hellbender habitat!